Ian Blei knows more about developing and maximizing personal effectiveness than anyone I know. He does it with brilliance and with heart." The Institute for Integral Enneagram Study’s mission is to develop and provide practical processes for individuals to further their consciousness development and evolution. The Institute is currently accepting enrollment applications for its 26-week Transformation Course. The Institute for Integral Enneagram Studies opened it doors in San Francisco in 2007. Its courses are designed by Founding Director Ian J. Blei, and are based on the culmination of decades of exploration, study and practical application. The Institute’s purpose is the development and delivery of practical curricula designed to increase awareness and consciousness, thus helping people to further themselves in their lives. Inspired by the premise that greed, aggression, and violence are functions of under-developed consciousness, not widespread psychological pathologies, the Institute for Integral Enneagram Studies will be dedicated to exploring, developing, and providing methodologies for accelerating this development of consciousness in people everywhere. The Institute provides unique opportunities for personal growth and a level of consciousness that encompasses holding multiple perspectives, and a vision of unity that replaces the “self-centered motivations” driving greed, aggression, and violence. The Institute’s commitment to facilitating the development of consciousness aims to directly affect a shift away from these issues on a global level. The curricula allows for individuals to learn the methodologies and applications, with the further opportunity to become teachers themselves. The primary goal for Mr. Blei and the Institute for Integral Enneagram Studies is to inspire the pursuit of higher consciousness as a popular and global phenomenon. Starting in the 1970's, Ian was fascinated by the consciousness and human potential movement; devouring books by Ram Das and Krishnamurti, and trying to bind patterns into a system or model of how consciousness works. Science Fiction novel "The Gods Themselves" by Isaac Asimov presented a metaphor of consciousness as a function of the interrelationships between three distinct processing centers, rather than a singular "brain-centric" center, and this concept changed Ian's life. He did a painting of his three-center concept in 1974, which became the logo to his coaching and consulting business many years later. At that time the ReVision Journal of Consciousness began publishing articles by everyone from Rene Webber to Nils Bohr, on theories of consciousness, and Ian's pursuit of "how we process" continued through the 1980's, after graduation, and throughout his career as a business analyst and consultant. Synthesis became Ian's stock in trade as he found that blending Process and Systems Management, with the studies of Philosophy, Psychology, the Enneagram, Coaching, Chaos Theory and the Natural Sciences, created problem-solving techniques, systems, and models that resulted in success for his clients, regardless of size or industry. Re-engineering organizations required re-engineering the consciousness of the people running the organizations. By working with an interrelated systems approach, he helped revolutionize business processes while helping people heal long-running conflicts that reduced their quality of life and productivity. Through the 1990's, the Consciousness Movement accelerated and spread with the influence of Ken Wilber and the Integral Institute, and what had been a somewhat "fringe" philosophy became more accepted and mainstream. Ian formed Optimized Results in 1999, as a base of operations for employing the strategies of his Integral Enneagram model in coaching and consulting, specifically in the area of communication. Typologies correlated to specific cognitive linguistic patterns, which functioned as a means for understanding and conflict management. Seeing the different Typologies as having different learning styles emanating from their different processing styles, the concept of a one-size-fits-all coaching methodology made little sense from the standpoint of the client. Much more individualized programs would have to be developed for a disparate sampling of people to benefit. Nine Curricula tailored to the Nine Types was imperative. Repeated successes with fun, happy, connected, prosperous clients and organizations added data to the evolving model, taking it to where the Institute for Integral Enneagram Studies became the natural next step. The Institute "creates an entity capable of developing and providing individualized programs on a larger scale for more people." 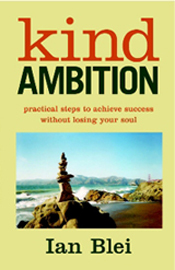 Author of "Kind Ambition: Practical Steps to Achieve Success Without Losing Your Soul," he has also written extensively on process re-engineering and organic business models, and is currently working on another book; mapping out the dynamics of relationships, based on cognitive linguistics resulting from their Enneagramic Typologies. Ian divides his time between writing, consulting, and speaking, and conducts seminars and workshops around the U.S. He is a musician, artist, and inventor, holding several patents.